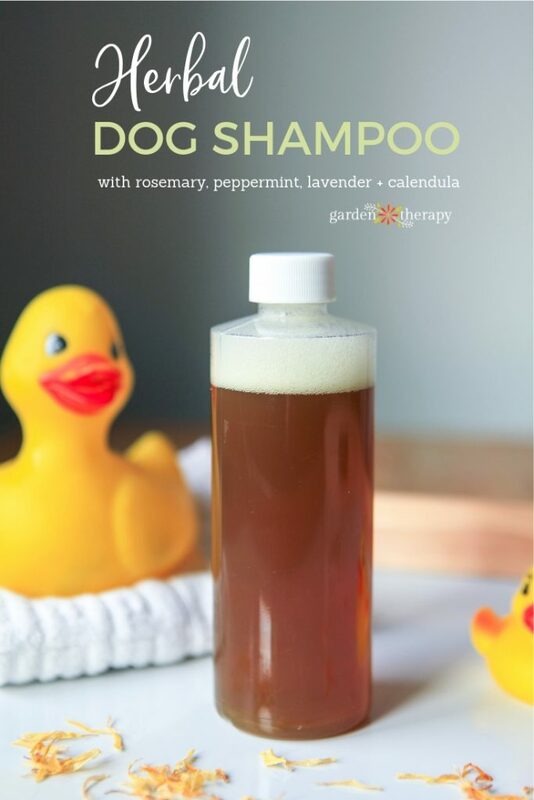 This homemade herbal dog shampoo not only leaves your puppy with a herb-fresh scent, but those herbs also work to deter fleas. 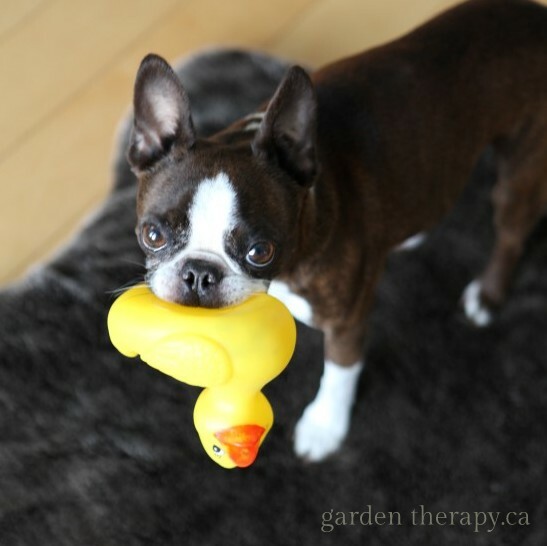 The recipe comes to us from the herb garden, making it powerful yet gentle on your furry friend’s skin. I’ve had dogs now for more than 20 years and they are wholeheartedly part of the family. 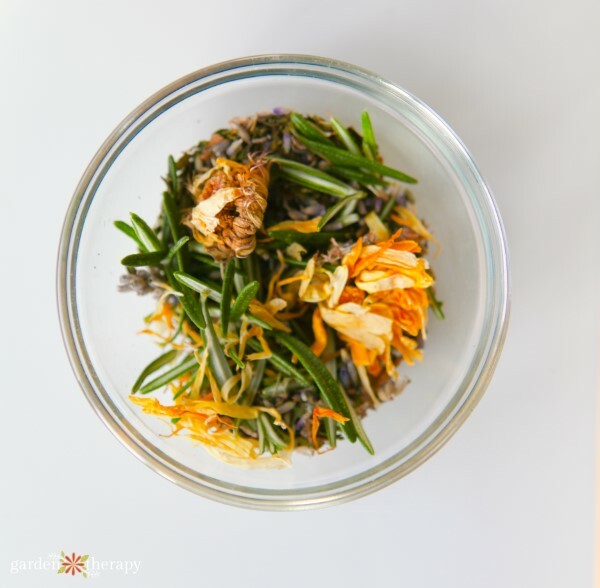 I feed our pets a raw diet that is closest to what they would get in the wild, and allow them to build up the natural oils in their fur which helps to protect skin and keep them feeling good. But I also make homemade dog cookies because, well, my dogs don’t live in the wild. And that’s a big BUT. Living with pets indoors can mean that they can sometimes get a bit stinky and bring in critters from the outdoors that I don’t want to adopt as pets. While I’m all for all-natural, I really, REALLY, don’t want fleas in the house. I don’t love the idea of using flea medication monthly, so I made a flea deterrent shampoo for my pooch. 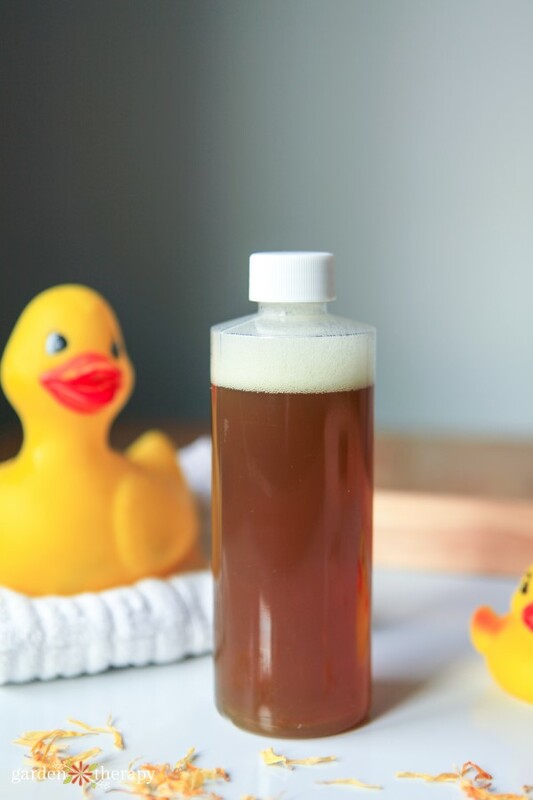 This all-natural shampoo is a gentle baby wash Castille base mixed with a herbal tea blend. Even though I lived in a neighbourhood (and house!) that had fleas, none of my dogs (past or present) have gotten them. 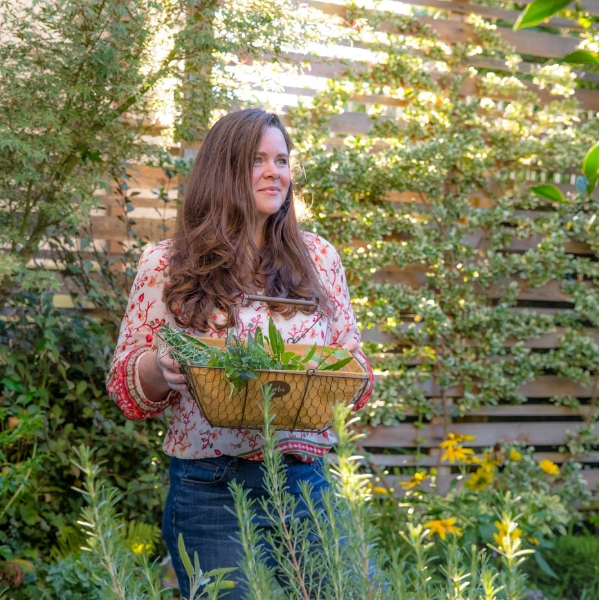 Hooray for herbs! I used to add a few drops of essential oils to this recipe, but the more I studied essential oils and pets, the more I feel it’s not necessary. I’m updating this recipe today to remove the essential oils, as I have stopped adding any in the last few years. The herbal infusion works wonderfully as it is and it doesn’t overwhelm my pup’s sensitive nose. You can add a few essential oils as well if dog isn’t sensitive to them. 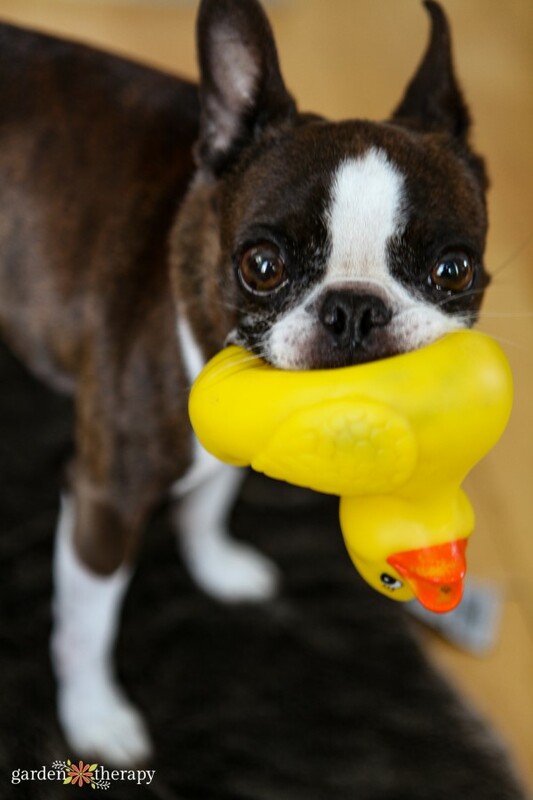 Meatball, my tiny Boston Terrier, did not have a reaction to the essential oils and did not mind the smell. He enjoys bath time (and especially the towel dry afterwards!). That being said, essential oils are powerful and so are dog’s sense of smell. So a little, just a drop or two, goes a long way and just a drop may still may cause a reaction in your dog. It’s best to research which essential oils are safe for pets and which are not (I wrote a bit more about that in this post). 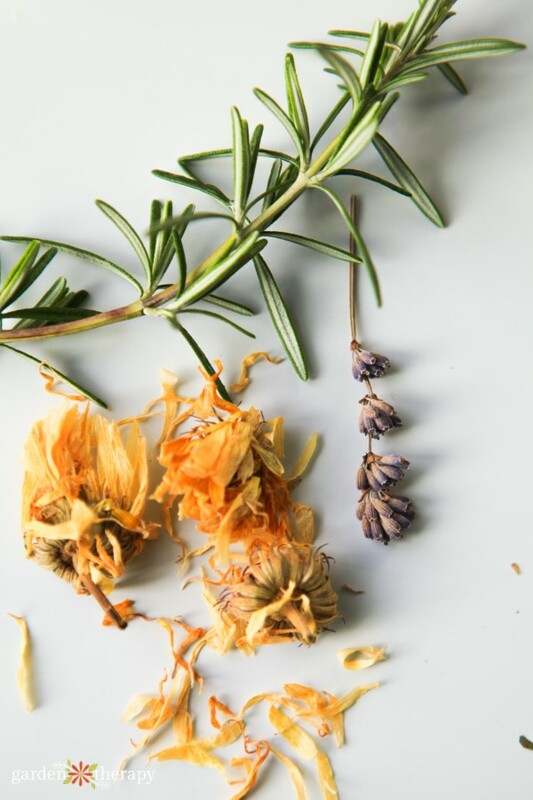 There are a ton of lists out there to go from, but the only oils that I personally feel comfortable with are lavender, rosemary, and peppermint. But again, in such a high dilution that it isn’t overpowering the pup. 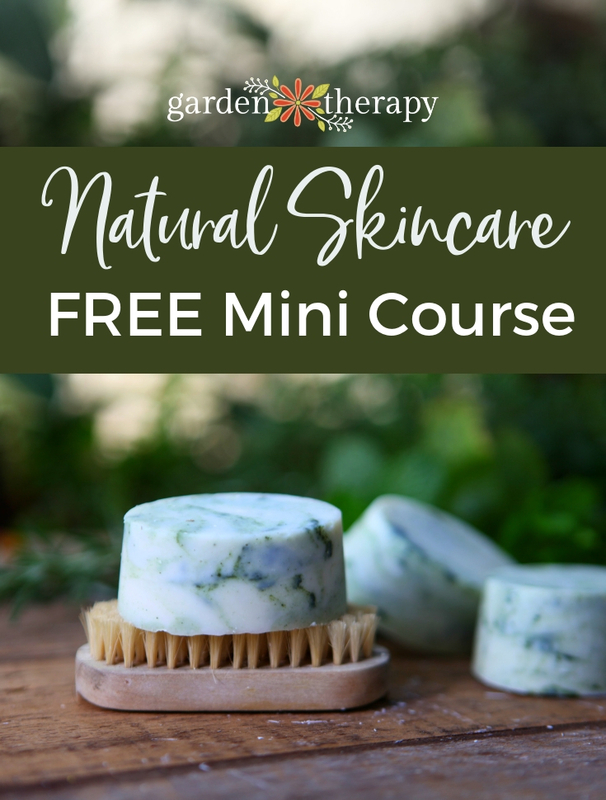 Herbs from the garden are infused into the shampoo to give a gentle topical skin treatment. Peppermint is for pain relief, rosemary is an antibacterial addition, lavender is for calming, and calendula is skin-repairing. These scents are infused into the water that you will use to dilute a gentle castile soap. 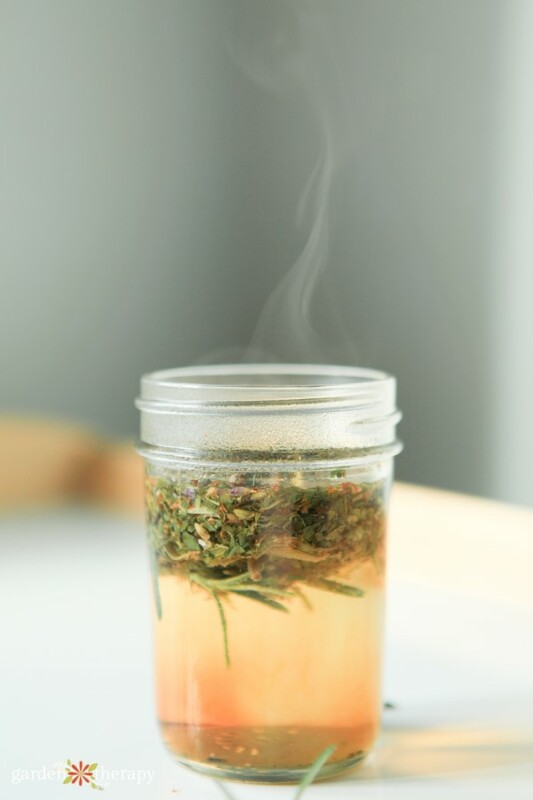 Make a herbal tea by soaking the chopped rosemary, peppermint, lavender buds, and calendula flowers in boiling water. Steep until cool, then strain through a coffee filter set in a fine-mesh strainer. Add the cool herbal infusion and the castile soap into a bottle and shake to combine. Give the shampoo a good shake and use within 3 months. Use shampoo monthly during flea season to deter fleas. Work shampoo into wet fur into a lather and give puppy a good scrub. Rinse well and towel dry pooch. If your pampered pooch does get fleas, then follow the shampoo with an apple cider rinse. Apply apple cider vinegar liberally all over the fur and skin and massage in. Rinse well with warm water and repeat if needed. I wish you had a way for us to just PRINT the recipe. This looks like a great natural option for flea control. I have a 4 1/2 lb dog and worry about dosage of any type of flea prevention. Hi Melissa, yeah, I get it! My dog is 8lbs.